The reddish or light brown coloring of the Indian Wolf is part of the reason that many believe it to be a fox when they catch a glimpse of it in the wild. They are very small wolves with 3 feet in length. They also have a coat that is shorter and less dense than other species of wolves. Since they live in a warm region though it is very fitting of their needs for survival. The mating process often takes place in October which is very different from other species of wolves. It is believed the timing of the rains which bring out additional food sources for these wolves is partial responsible for that timing. The mother will have several dens in a given area and move her young around often. They come out when they are about three months of age. The entire pack will help to care for them. While they mother goes to hunt for food others will care for them. It won’t be long before they are joining her on hunting for their own food. 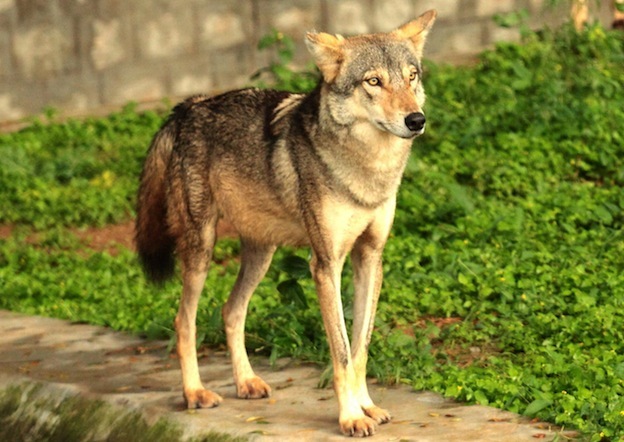 It is believed that only about 3,000 Indian Wolves remain in the wild today. There is only one known location at this time where they are kept in captivity. This is the Jai Samand Sanctuary in Rajasthan. Due to the bad reputation that these wolves have and the poor economic area where they live, it is hard to get effective practices in place for conservation. Many feel that the funding should be spent on helping the people of India instead of protecting the wolves. It becomes an issue where ethics and politics continue to present red tape to get through. There are stories in India about this particular wolf stealing small children. However, experts don’t believe this is true. Instead they believe such stories have been passed along from generation to generation as a way to get children to stay close to the villages. It is also believed some children may have been taken by other animals, but that the Indian Wolf isn’t has all blame.